The National Company Law Tribunal (NCLT) on Wednesday admitted insolvency proceedings against Jaypee Infratech Ltd. The Allahabad bench of the NCLT accepted the petition moved by public sector lender IDBI Bank and classified Jaypee Infratech as insolvent. IDBI Bank, the leader of the syndicate of lenders to the Jaypee Group, approved the appointment of an interim resolution professional who will assess if a resolution of the company's debt is possible. The professional will meet with Jaypee’s creditors to see if a resolution of the company’s debt is possible. According to the Insolvency and Bankruptcy Code, the appointed official will get 270 days to turnaround the company's finances. In case the turnaround doesn’t happen, the company’s assets will be liquidated. Meanwhile, the board of directors of the company remains suspended. As on 31 March, the consolidated debt of Jaypee Infratech was over Rs 7,922 crore with a negative interest coverage ratio, which means the company is not earning enough to repay its debt. NCLT’s decision is a big setback to thousands of buyers of various properties that were being constructed by Jaypee in Noida, Greater Noida and elsewhere. Under the current circumstances, the secured lenders of Jaypee will have the first right to the company’s assets. 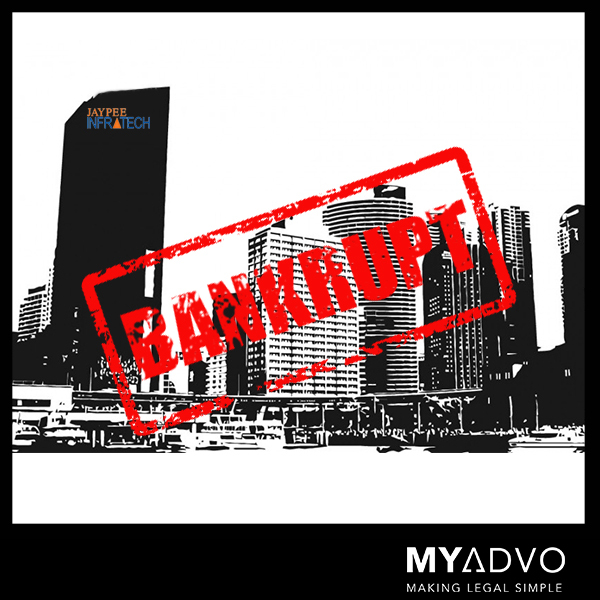 In case the lenders are unwilling to convert their debt into equity, there will no option but to liquidate the company, leaving the buyers of the company’s under-construction properties with little choice. These buyers have already filed cases against the company at various consumer courts in the country. The projects, already delayed by four years, include Kensington Boulevard, Aman, Kassia, Kalypso, Klassic, Krescent and Cosmos. Other than Jaypee Infratech, various benches of NCLTs have so far admitted insolvency proceedings against 10 companies, including, Monnet Ispat, Jyoti Structures, Electrosteel Steels, Amtek Auto, Essar Steel, Bhushan Steel, Bhushan Power and Steel, Jaypee Infratech, ABG Shipyard, and Alok Industries. The decision is pending in case of Lanco Infratech Ltd and Era Infra Engineering Ltd.
"Jaypee Infratech has withdrawn all the objections with respect to its admission under the Insolvency and Bankruptcy Code (IBC). This has been done keeping in mind the interest of all its stakeholders including the home buyers and depositors," the company's lawyer R.P. Agarwal was quoted as saying. For Jaypee Infratech, the problem started after the 2013 order of the National Green Tribunal—that restrained the concerned authorities from giving a nod for the construction activity falling within the 10km radius of Okhla Bird Sanctuary pending approval from National Board of WildLife—leading to delays in construction. This, coupled with falling revenue from the real estate business, contributed to the stress. Stay updated with Myadvo for legal news and top legal updates in India!